You are currently browsing the tag archive for the ‘Akiko Enokido’ tag. 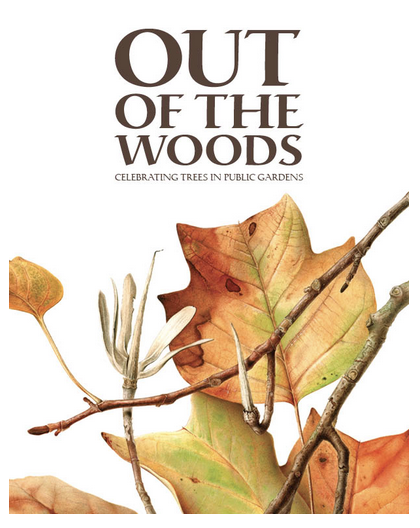 The Third New York Botanical Garden Triennial, Out of the Woods: Celebrating Trees in Public Gardens is on display at the The New York Botanical Garden, in Bronx, New York from November 18, 2017 – April 22, 2018. Information about the exhibition, including images of all the artworks is on the ASBA website. Forty-four artworks were selected from more than two hundred submissions, depicting one of the planet’s most important and beautiful resources: trees. Each of these subjects have been found in botanical gardens and arboreta throughout the United States and around the world. Artists have been working on this project for the past three years, not only capturing images of trees, but also drawing attention to the institutions that shelter them: botanical gardens and arboreta. 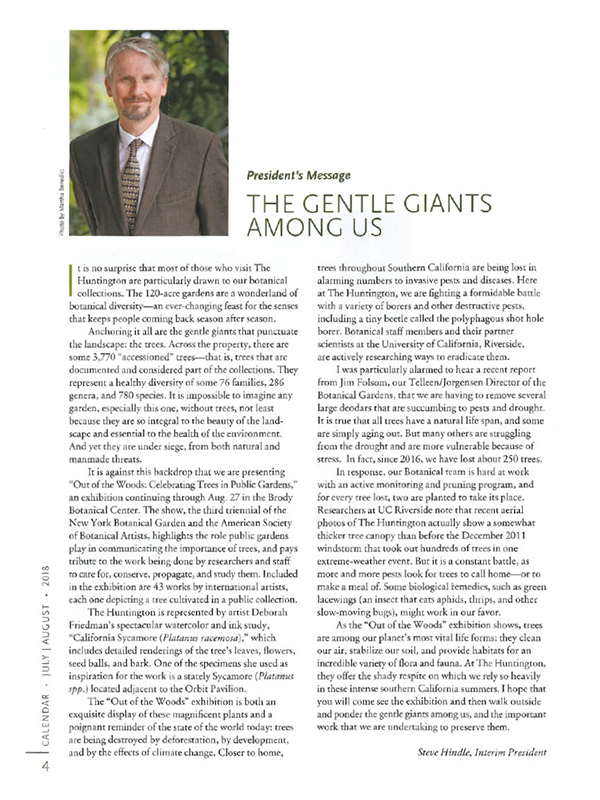 A central goal of the exhibition is to highlight the role of botanical gardens and arboreta in the research/scholarship they provide, as well as their education and outreach to the public. The artists respond aesthetically to these inspiring subjects, and have depicted everything from seedpods to branches and bark to an entire forest floor. Each artist has written a statement about their artwork; artists’ statements can be read on the ASBA website. As with previous New York Triennial exhibitions, Out of the Woods will be traveling after the closing date at The New York Botanical Gardens, including coming to The Huntington Library, Art Collections and Botanical Gardens in May, 2018. Watch for future postings of lectures and other activities at The Huntington that will occur around the exhibition. 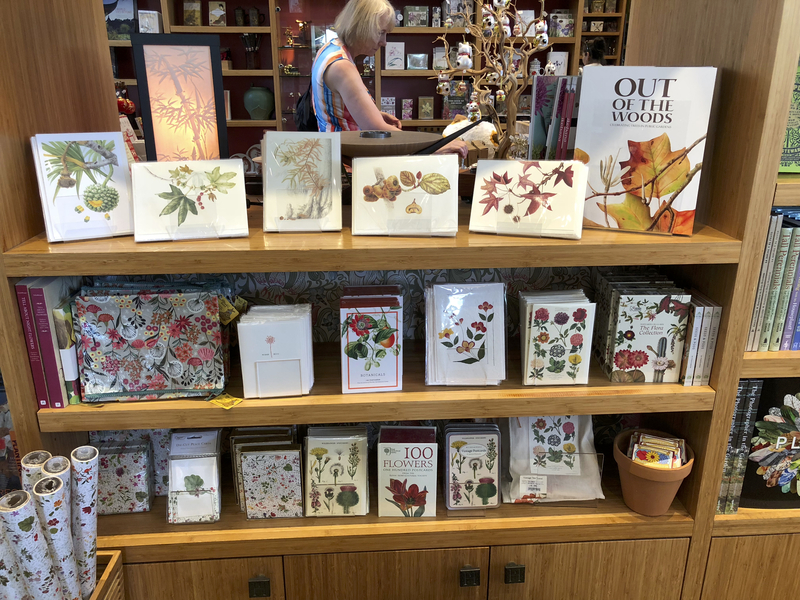 BAGSC Members also will host a concurrent exhibition of local artists around the same theme at the Brody Botanical Education Center at The Huntington. The current traveling schedule includes: The Huntington Library, Art Collections, and Botanical Gardens, San Marino, CA, May 19 – August 27, 2018; Foundry Art Centre (in time for the next ASBA conference), St. Charles, MO, October 5 – December 28, 2018; Tucson Botanical Gardens, Tucson, AZ, January 25 – April 13, 2019; Minnesota Landscape Arboretum, Chaska, MN, May 9 – August 13, 2019. Front cover of exhibition catalog, featuring Leiden’s 300-year Old Liriodendron tulipifera, by © Esmée Winkel, watercolor on paper. Exhibition catalogs may be purchased on the ASBA website for $12.00 ($10.80 for NYBG members). The full-color, 60-page catalog features all of the artwork in the exhibition as well as essays illuminating the pivotal importance of living collections in the conservation of the planet’s trees, and the continued significance of botanical art in the 21st century. Flora Japonica opened mid-September, 2016 at the Royal Botanic Gardens, Kew, in London. Before the opening, I personally felt very overwhelmed and was worried about how we would be received. It turned out GREAT! The people at the Kew were so nice and friendly. When Dr. Shirley Sherwood congratulated us at the opening speech, I felt so honored to be a part of the celebrated show. There is so much to tell about the exhibition. There are, however, so many good writings about the show already available. Instead of summarizing those good reads, I thought I would make a list of the links for you to visit. Meanwhile, I would love to share my thoughts on several specific artworks. This are just my opinions and maybe rather boring ones at that, but I hope you enjoy walking with me through the show. I have mentioned that these are just my opinions. Keep in mind, my bold statement is this: I think that most Japanese endemic plants are rather unflattering. Meaning that they are not obviously gorgeous like roses, tulips or tropical plants. Maybe this is the case not only with Japanese native plants; perhaps many endemic plants appear very humble looking. Well, really? It could be because these plants are not looked at properly. Idesia polycarpa, watercolor on paper, © 2016, Akiko Enokido. 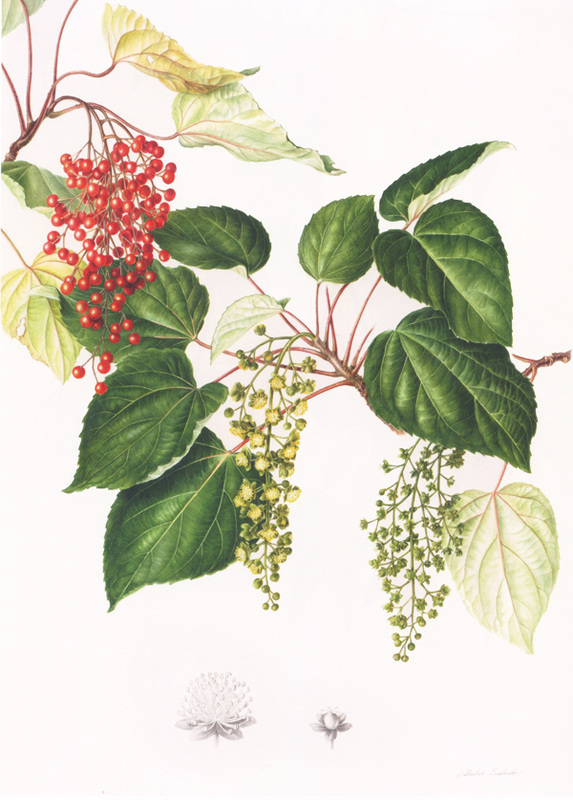 Take a look at the watercolor Idesia polycarpa by Akiko Enokido. I think the actual plant (not her painting!) is very modest looking. Its male and female flowers are especially small and plain. However, if you look at it up-close as Akiko did, it is obvious that the flower clusters are very gorgeous! Akiko successfully converted the modest look of the plant into a dynamic figure using her vivid and strong color. The beauty is sometimes there in front of us, but it doesn’t reveal itself until we open our eyes properly. I think as artists we have the wonderful power to help open the secret door, clearing the smoke that hides nature’s beauty. Speaking of color, I thought many of the artists’ subjects held a very clean but pastel color. I wondered how they achieved their shades. On first look, I thought perhaps the artwork was done in color pencil, but no, it was watercolor. In some parts, I saw tiny, tiny brush strokes. Instead of washing those stitches out, the artists kept them, floating them onto white paper, like a Georges Seurat painting. I couldn’t get an answer about this technique from my fellow artists, so I will tell you when I find out. 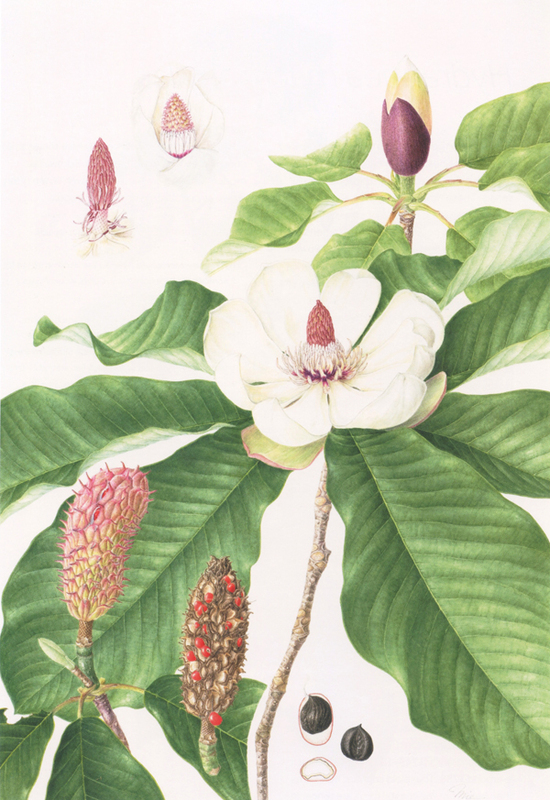 Magnolia obovata, watercolor on paper, © 2016, Mieko Konishi. You may have the same question I have: how to portray something huge like a whole tree, or a plant like Magnolia obovata, which has leaves that grow up to 45 cm long and 25 cm wide? Two fantastic artists had the answers for me in this show. The way Mieko Konishi portrayed Magnolia obovata was awesome! She positioned a main flower right up the center, and from it huge leaves spread in all directions. The leaves are cropped off in the middle. Only the two front leaves show almost the complete leaf shape, but even these leaves are cropped off at the tips. This is a huge painting already, but Mieko uses cropping and composition to indicate that the plant is too big to fit the paper. Her image reminded me the surprise I had when I picked up a Magnolia obovata leaf from the ground. I knew it was big, but seeing the actual leaf and holding it gave me additional amazement. Pinus x densithunbergii, watercolor on paper, © 2016, Masumi Yamanaka. The other example is done by Masumi Yamanaka. Unfortunately, I couldn’t see her Pinus x densithunbergii in person. It was planed to be exhibited at the Japanese embassy in London a few weeks after I visited. 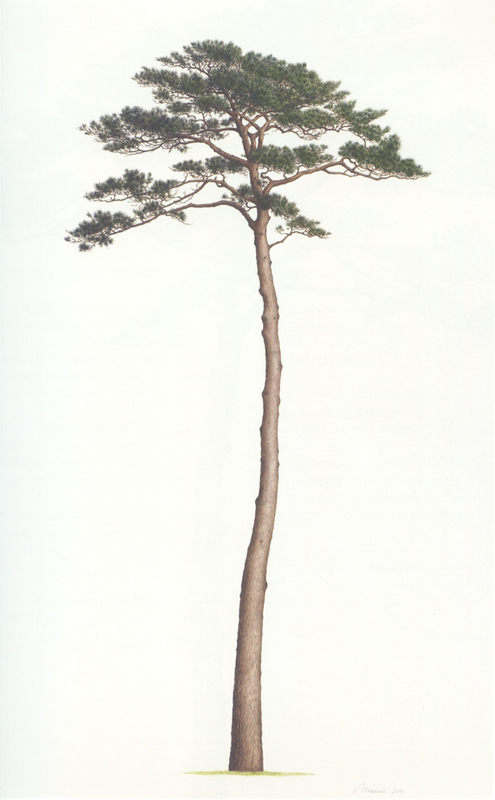 This tree is known as the “Miracle Pine”, which survived the devastating tsunami that accompanied the Great East Japan Earthquake in March 2011 and somehow remained standing, even though the entire 70,000-tree pine forest along the beach was uprooted. I had a privilege, however, to visit her studio in Kew Garden where she works with other official botanical illustrators of Kew. I could go on and on about the visit, but I would like to go back to her tree painting. I wondered how she created the tree painting without the actual tree in front of her. I watched her short documentary about the painting. Yes, she had many many references of the tree. Yes, she visited the actual tree and made the color samples at the site. But if she had had only those references, the tree would not be portrayed as accurately as it is in her artwork. 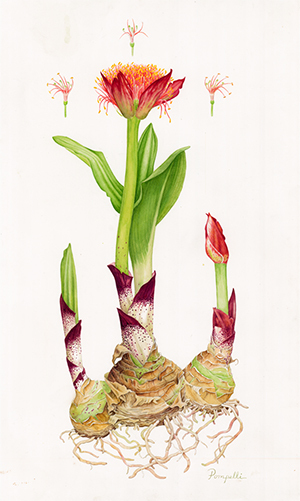 What her painting contains is her experience and knowledge as a botanical illustrator. She has studied hundreds and thousands of plants with her keen observation and has painted them. This wisdom is laid on underneath the image. I think the time we spend on a painting is not only spent on that specific artwork, but the knowledge we gain remains and accumulates in us as wisdom. When I walked in the Kew garden and bumped into one of the trees Yamanaka had portrayed, I had a warm sensation as if I had just run into someone I knew. Lastly, I couldn’t pass up telling you about what I do not know how to explain. Confusing, yes. 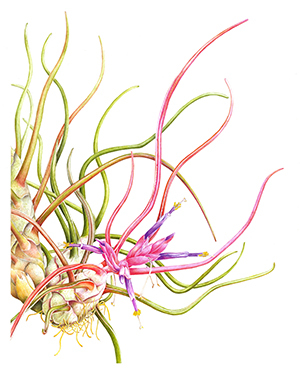 Cercidiphyllum magnificum, watercolor on paper, © 2016, Mieko Ishikawa. I just had a “wow” when I saw Mieko Ishikawa’s Cercidiphyllum magnificum. The plant itself is again, very humble looking at first glance. Yet it grabbed my attention immediately. What captured me the most is the perfection of the drawing, The leaves look soft and slightly rounded, and the male and female flowers are delicate, yet lively. It is extremely realistic, yet informative. Even though she includes many details in various sizes and different angles, everything fits fantastically into one frame. In her illustration, I think that Art and Science meets in a precise middle point and keep a golden balance. Well, to be honest with you, I have no background nor knowledge of the science of botany, so I may have no idea what I am talking about. There are just so many things in this one painting to gaze at, to be amazed by, to learn, and questions to pose and think about. “Good artists copy; great artists steal.” This is a famous quote by Picasso. I simply wish he also told us how to steal it. 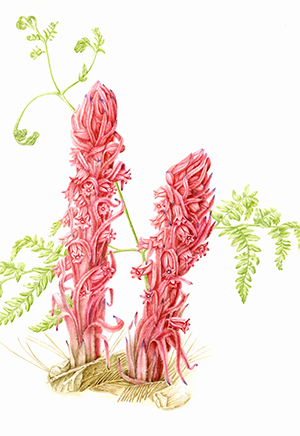 The Flora Japonica exhibition is open from 17 September 2016 to 5 March 2017, 10 am to 5:30 pm in the Shirley Sherwood Gallery of Botanical Art at the Royal Botanic Garden, Kew, London, UK. Price is included with entry to the Gardens. This exhibition includes about one hundred Japanese wild, native, endemic plants, portrayed by 36 of the most eminent contemporary Japanese botanical artists. The exhibition also features historic drawings and paintings by some of Japan’s most revered botanists and artists such as Dr. Tomitaro Makino (1863-1957), Sessai Hattori and Chikusai Kato (Edo period artists 1603-1868). 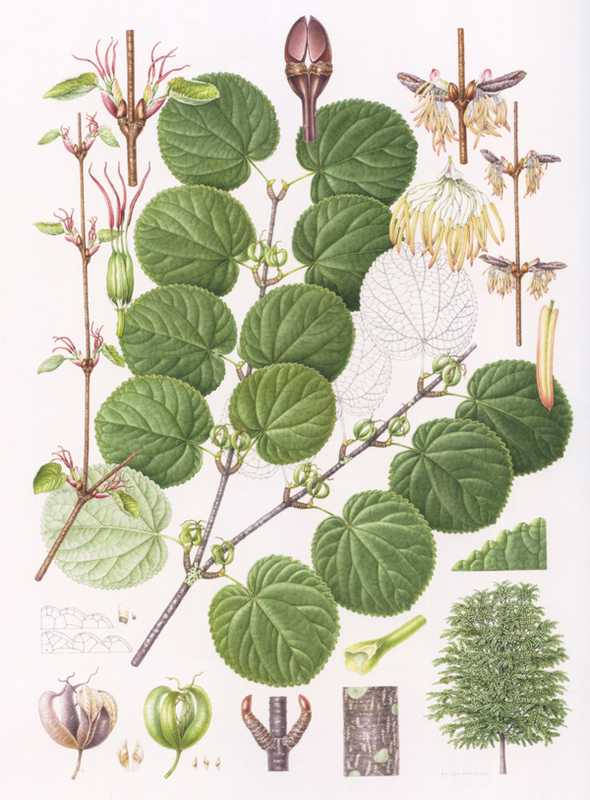 Additionally, works from Kew’s Illustration and Economic Botany collections also are on display, including an early Japanese botanical illustration, Honzō Zufu by Kanen Iwasaki (1786–1842), an illustrated encyclopaedia of medicinal plants from 1828, and Japanese wood panels by Chikusai Kato (1878), which are made from the wood and framed with the bark of the trees that they depict. Royal Botanic Gardens, Kew is located at: Kew, Richmond TW9 3AB, United Kingdom, +44 20 8332 5655. Find information about Flora Japonica on Kew’s website. Two press releases about the exhibition can be found here, and here. Purchase the Flora Japonica catalogue. Read the DAIWA Foundation article about the exhibition. Read about the Flora Japonica exhibition on Asuka’s website and view Asuka’s artworks and exhibitions. Akiko Enokido at the RHS Exhibition with a few of her watercolors of heritage Camellia japonica. Congratulations to Akiko Enokido for her Gold Medal at the RHS London Botanical Art Show, for her paintings of heritage Camellia japonica in watercolor on vellum. Akiko sends a big hello to BAGSC members from London! 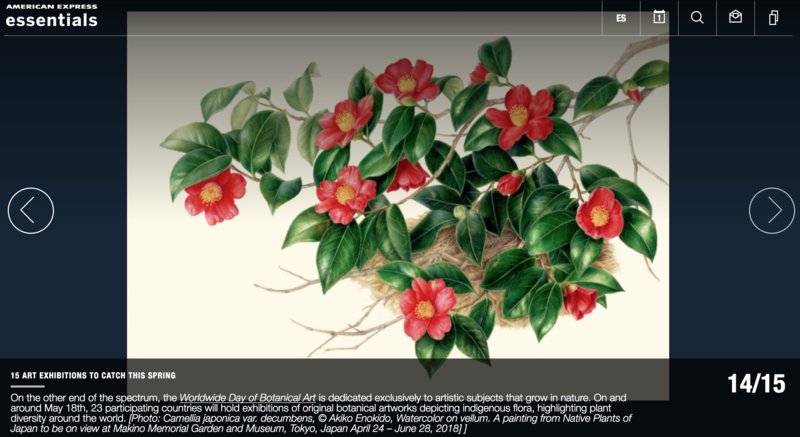 As Akiko explained, one of the oldest camellias among her paintings is ‘Masayoshi’. 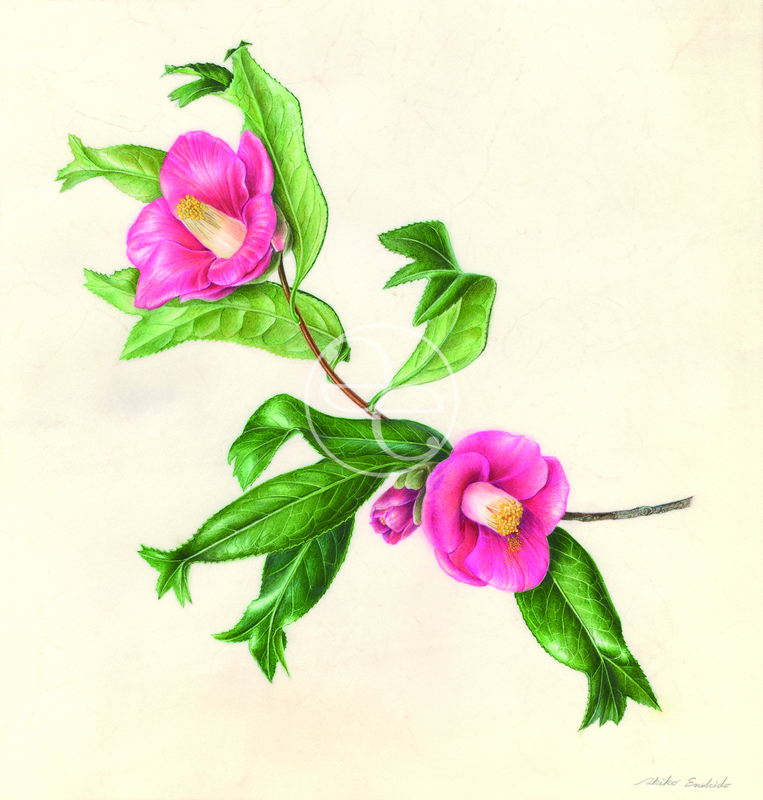 This camellia was carried to the Netherlands by Dr. Siebold in 1829 and named ‘Doncklaeri’. 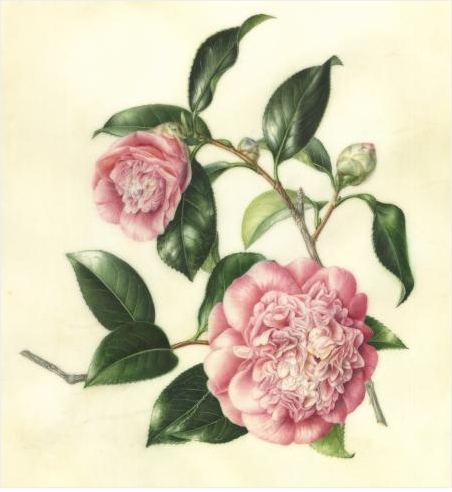 This is the plant that became the basis for the cultivation of many new types of Camellia in Europe during the 1800’s. Nepenthes! 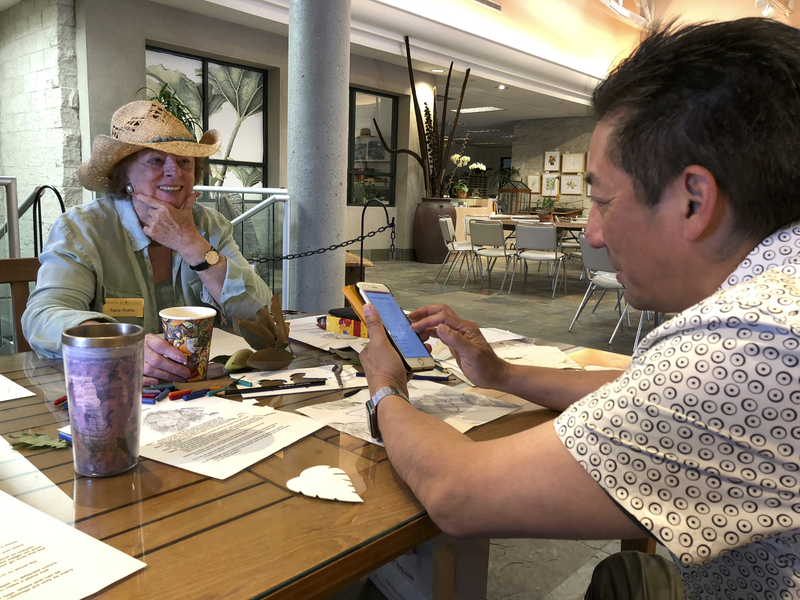 The very epitome of Weird, Wild, and Wonderful was the subject of a three-day pre-symposium workshop led by Mieko Ishikawa, a featured artist in the Weird, Wild & Wonderful exhibit currently on view at the Brody Botanical Center at The Huntington and also a Keynote Speaker at our symposium. Mieko Ishikawa graciously traveled across the Pacific to join us here in Southern California. 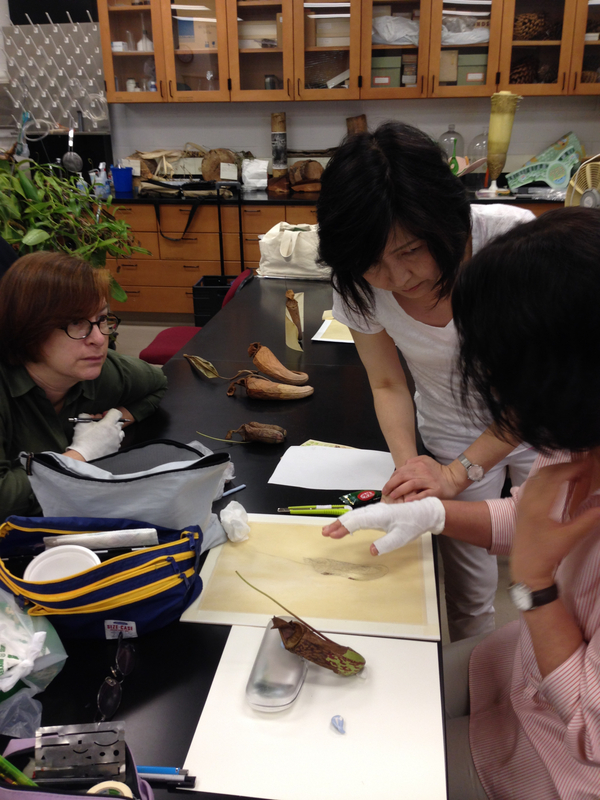 Her first event of the Symposium was her three-day workshop on Nepenthes. 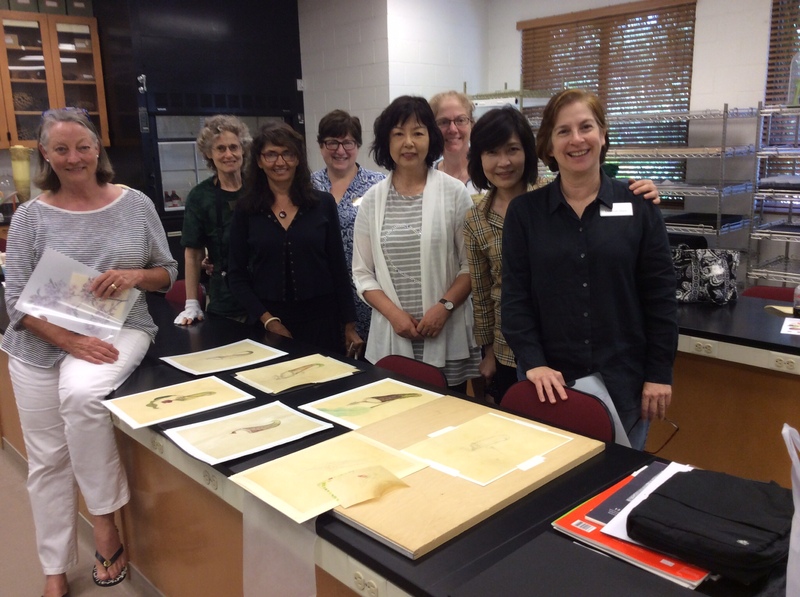 The Huntington botanical gardens staff kindly cultivated and provided living Nepenthes plants for the workshop, and Mieko provided Reindeer Vellum for her students’ paintings. 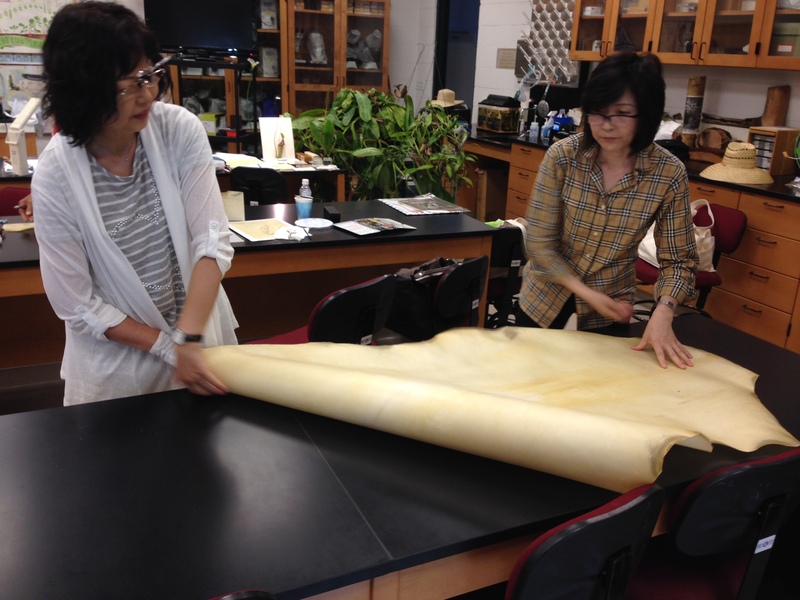 Meiko Ishikawa and Akiko Enokido unroll Reindeer Vellum to show the class what a whole skin looks like. First Mieko treated us to a wonderful presentation about her adventures finding and painting the very special plants of Borneo. We then enjoyed a behind-the-scenes tour of The Huntington greenhouse where the Nepenthes were grown. Robert Hori of The Huntington and BAGSC’s very talented Akiko Enokido provided interpretive skills for the workshop. After three days of intense study, graphite drawing on our vellum, and very careful application of watercolor on our drawings with extremely tiny brushes, we all had a much greater understanding of the stunning talent and achievements of Mieko Ishikawa. Her mastery of the structure of the plants, as well as her breathtaking artistic talent, gave all of us an enormous dose of inspiration to continue learning and painting! 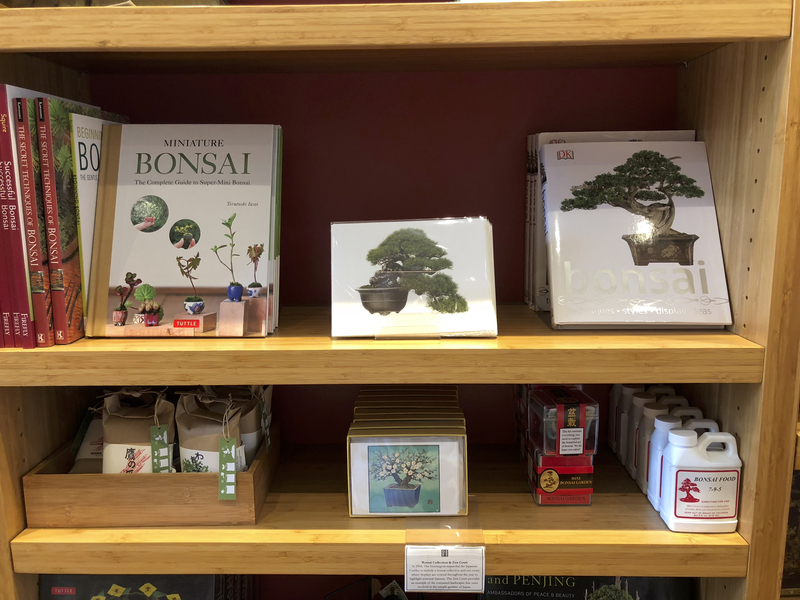 Many, many thanks to everyone who made the workshop possible – including The Huntington gardens’ staff, the ASBA, the amazing BAGSC women who organized the symposium, and especially our tireless and patient instructor, Mieko Ishikawa. Workshop participants with their Nepenthes paintings. Akiko Enokido, Camellia japonica ‘Kingyoba tsubaki’, common name, Goldfish Camellia. Watercolor on vellum, © 2014, all rights reserved. 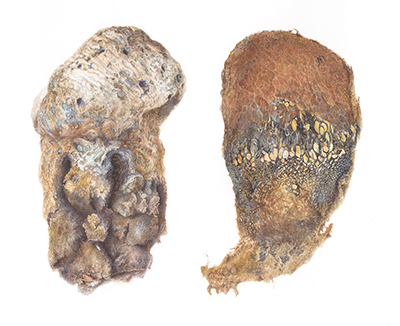 In addition to previous postings about BAGSC members’ acceptances, BAGSC member Akiko Enokido was also accepted into the 18th Annual International Show of the American Society of Botanical Artists (ASBA) at The Horticultural Society of New York. The camellia cultivation started in 17th century in Japan. Goldfish Camellia is one of the old species. Most of the flowers are single layer, pink or white. But the foliage is appropriate to its name, and you can see the tip of the foliage split into three to five segments, which looks like a fishtail. The leaves are unusually shaped and each leaf is different, showing different expressions and movement. These are really odd but lovely, even when they’re not in bloom. I picked one of the enchanting branch with leaves that looked like many fishes swimming and jumping. Congratulations to Akiko and to all BAGSC members in the exhibition! Multi-petalled flower, watercolor work in progress. © 2014, Akiko Enokido. 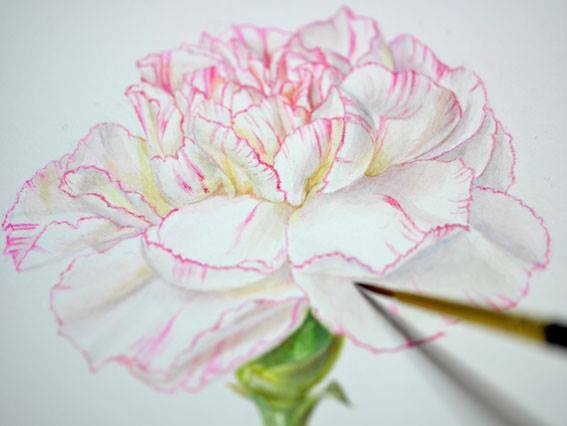 Akiko Enokido will be coming to the Virginia Robinson Gardens to teach us how to work on multi-petalled flowers and how to shade. Plus, students can also bring unfinished work to finish. For those who have taken a class from Akiko before, you know that she not only brings her wonderful artist’s talent to share but also a teacher’s understanding of how to help those of us who aspire to be better artists. I look forward to seeing you, and if you have any questions please email me and I will try to to help. Classes will be held in the Pool Pavilion, Virginia Robinson Gardens, 1008 Elden Way, Beverly Hills. Fee for the two day session is $200 for Friends of Robinson Gardens and $225 for non-members. A non-refundable deposit of $100 to hold space can be accepted but full payment must be received by June 20. To make reservations visit http://www.RobinsonGarens.org or call Bianca at (310) 550-2068. A supplies list will be sent to all participants upon registration. Coffee, tea and water will be provided, but please bring your own lunch. 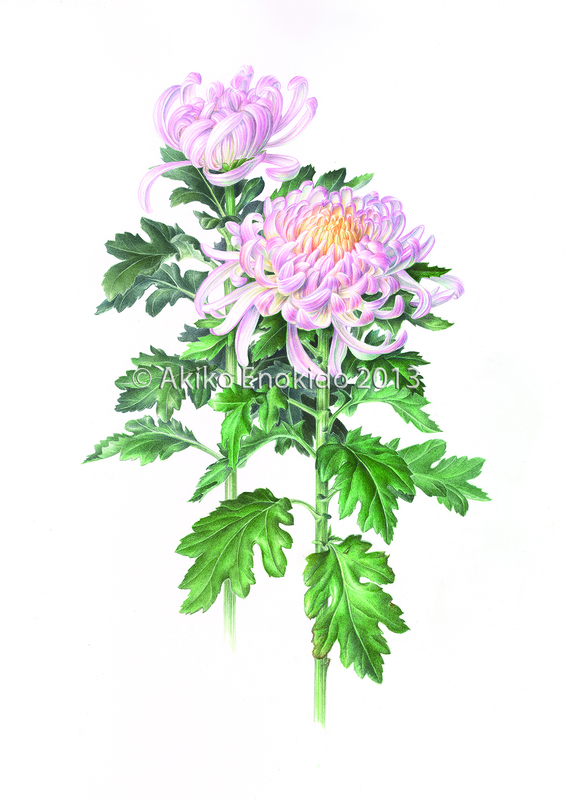 Akiko Enokido is a long time award winning member of Botanical Artists organizations in America and Japan and and has been accepted in the most important exhibitions in both countries. Her beautifully rendered paintings are known for their exquisite color, detailing and composition and are prized by their owners including the Hunt Institution, curators of the most important modern botanical collection in America. BAGSC member Akiko Enokido is returning in December, 2013, and will teach two, three-day watercolor classes. BAGSC is experimenting with having the same teacher in two different locations for added convenience. Sign up for one or for both! Start forcing your choice of bulbs in November or sooner to bring to class, or you can even bring sprouting garlic or onions from the pantry; your subject matter is your choice. If you would like to have your drawing already prepared before class, that would be wonderful. A $50.00 non-refundable deposit can be sent to Leslie, check made out to BAGSC, with “Akiko, Arboretum” in the memo line. Maximum class size is 16 people, first come, first served. The total amount is due by Friday, November 8. You can also send the total amount and skip the deposit step. Your check won’t be deposited until the start of class in December. 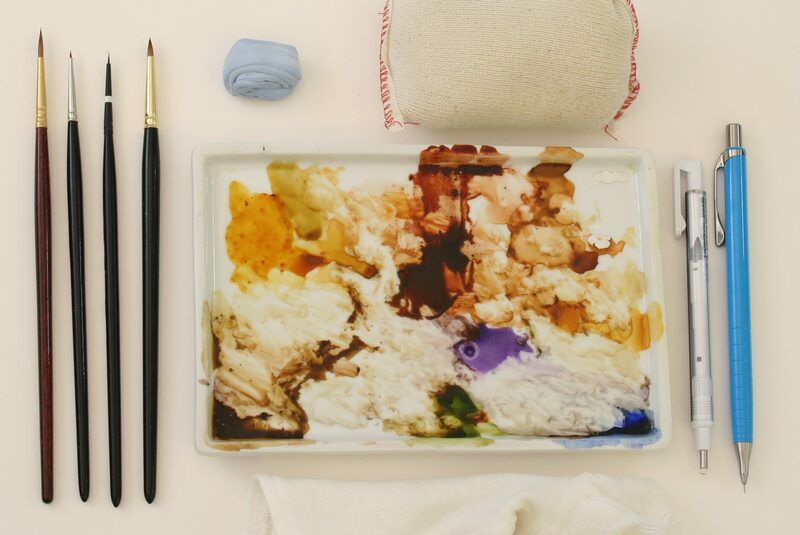 Bring your usual supplies for drawing and watercolor painting. If any special art supplies are needed, a supply list will be sent to participants upon registration. Bring your own lunch, or you may purchase it at the Peacock Café at the Arboretum. 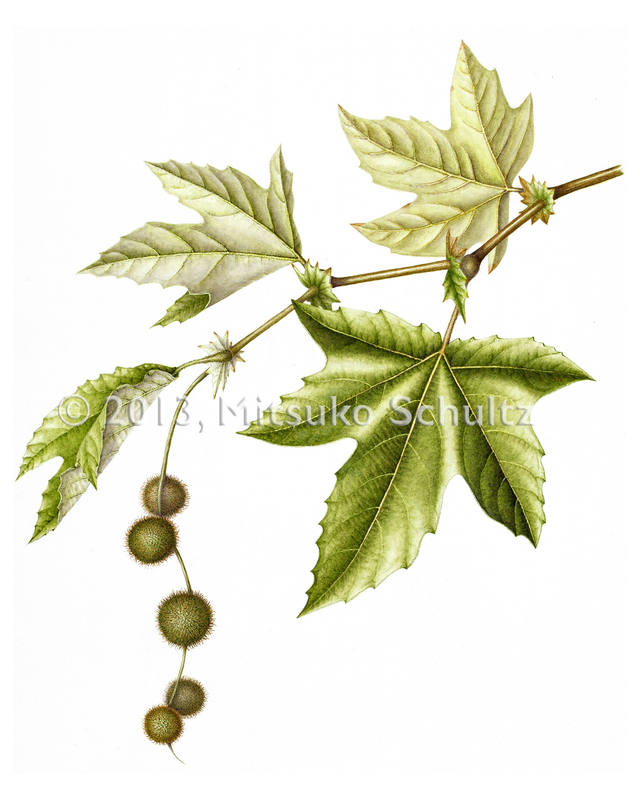 Quercus agrifolia, Coast Live Oak, watercolor by Akiko Enokido, © 2010, all rights reserved. 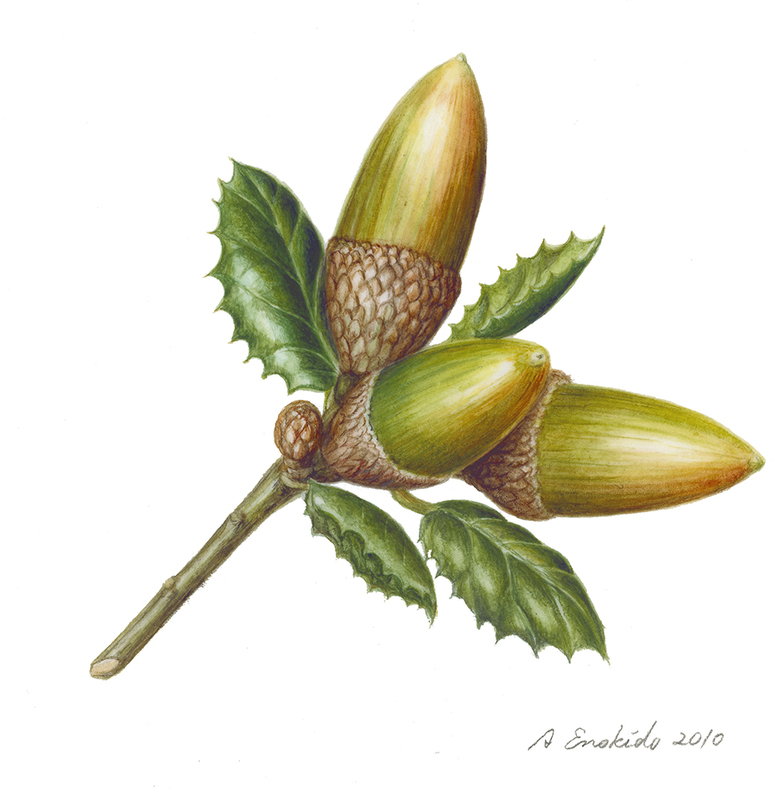 California native acorns and oak leaves will be provided; if you have other acorns and oak leaves you’ve collected and would like to paint, please feel free to bring them. If you have lots you want to share, please bring those as well! A $50.00 non-refundable deposit can be sent to Leslie, check made out to BAGSC, with “Akiko, Santiago” in the memo line. Maximum class size is 16 people, first come, first served. The total amount is due by, Friday, November 8. You can also send the total amount and skip the deposit step. Your check won’t be deposited until the start of class in December. Detailed directions will be provided to class registrants. The Santiago Park Nature Reserve is not hard to find, and is easily accessible from the 5 and the 22 Freeways. It is highly recommended you bring your own lunch; There are large shopping centers across the street in two directions, but the lunch places are busy with business people, and it would take quite a bit of time away from class. Akiko Enokido is a long time member of the Botanical Artists organizations in America and Japan and has been accepted in major exhibitions. Her beautifully rendered paintings are known for their exquisite color, detailing and composition and are prized by their owners. 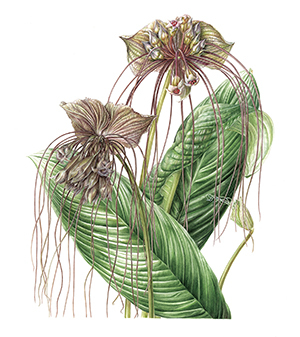 Akiko has shown her work in the United States and Japan, including the ASBA/Horticultural Society of New York exhibitions, and the 13th Annual Exhibition of Botanical Art and Illustration from the Hunt Institute for Botanical Documentation. Classes will be held at Virginia Robinson Gardens, August 5, 6, and 7, 2013, from 9.30 am – 3.30 pm daily. A supplies list will be sent to all participants. Coffee, tea and water will be provided, but please bring your own lunch. Fees for the three day session will be $375. for members and $450. for non-members. A deposit of $100. to hold space can be accepted but is non-refundable. Full payment must be made by August 1, 2013. To make reservations, visit the Virginia Robinson Gardens website, or call (310) 550-2068. If you have any questions, please contact Tania Norris.